Cypriot Food, Desserts & Drinks. Learn about Cyprus Meze and other Cypriot delicacies. A holiday to Cyprus wouldn’t be complete without trying some of the traditional Cypriot dishes and delicacies. If traditional Cypriot food is what you are looking for (and you should be) we have used our love of food to come up with a lot of useful tips and a list of definitions to help you navigate Cyprus cuisine. (If you live in Cyprus and are already familiar with Cypriot food, check out our top 10 restaurants in Paphos and restaurant reviews. In Cyprus, you can find just about any type of ethnic food as well as American and International franchises, but we recommend while in Cyprus eat what the locals eat since it is fresh as well as tasty. You can allways find the 24 hour bakeries, even the small tavernas can dish up a great meal. Fruits and vegtables are freshly picked and the bread is always baked daily. Abundant vegtables, pulses and grains are a large part of the Cypriot diet. Goats milk, cheese olives, wild greens, potatoes, capers, nuts and herbs form the basis of many Cypriot delicacies. Every corner in Cyprus from the towns to the villages have traditional souvlaki shops that serve chicken or pork kebabs in pita bread or on a platter. They also serve delicious gyros with beef. Most hotels have at least one restaurant that will offer traditional Cypriot food which is fine, but nothing beats going out to a real tavern. Most taverns are located in village centers and almost all villages have at least one and some villages have several. Every taverna offers a Meze with a variety of dishes available and many also do great vegetarian and vegan mezes upon request. The standard meze is either meat or fish for the main dishes and a plethora of small, side dishes ranging from salads, potatoes and eggs to hummus and tarmasalata. You don’t have to order the Meze as there are other choices generally, but it is well worth it and it is the most popular way to dine at a taverna. Meze - Literally means "small dishes." A style of eating that has many different courses, but each course contains just a little of each item, enough for everyone to have a taste. Afelia: A Cyprus specialty made from pork, red wine, mushrooms, potatoes and coriander seeds. Calamari - Fried squid. Calamari in Cyprus is tender and especially tasty with fresh lemon juice. Feta - A salty, white cheese made from sheep's or goat's milk that is cured in a brine solution. Halloumi - A Cypriot cheese made from sheep or goat milk. It has a high melting point and is usually fried or grilled. It can also be served in sandwiches, salads or with fruit particularly watermelon and wine. Horiatiki Salata - A Greek or country salad. It is made of tomatoes, cucumbers, green peppers, feta cheese, olives, olive oil, and vinegar - but no lettuce. Hummus - A dip made from chickpeas and tahini. This is nearly always served as part of a meze however, it is originally Lebanese. Tahini - A pureed sesame seed paste that can be used as a dip or as an ingredient for other dishes. (This is also of Lebanese origin). Tirokafteri - A spicy, hot cheese dip. Kalamata Olives - The deep purple olives from the Kalamata region of Greece. 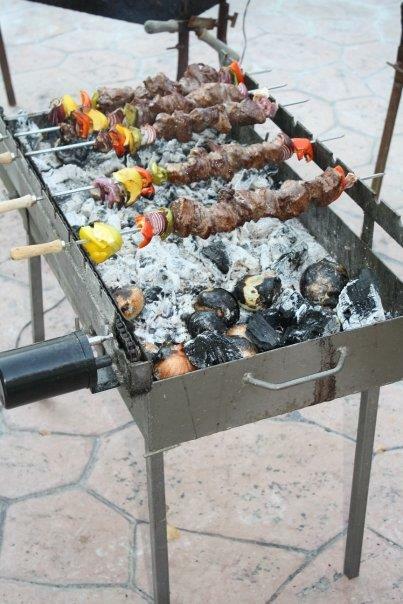 Kebob/Kebab - Skewered meat which can be pork, lamb or chicken. Moussaka - A layered dish of eggplant, lamb, and tomatoes. Sheftalia - A grilled Cypriot sausage made of pork, lamb, onions, parsley, salt and pepper wrapped in a membrane of a lamb or a pigs stomach. Souvlaki - Literally, little skewers of meat. It is can be served either as a sandwich in a pita or on the skewers. 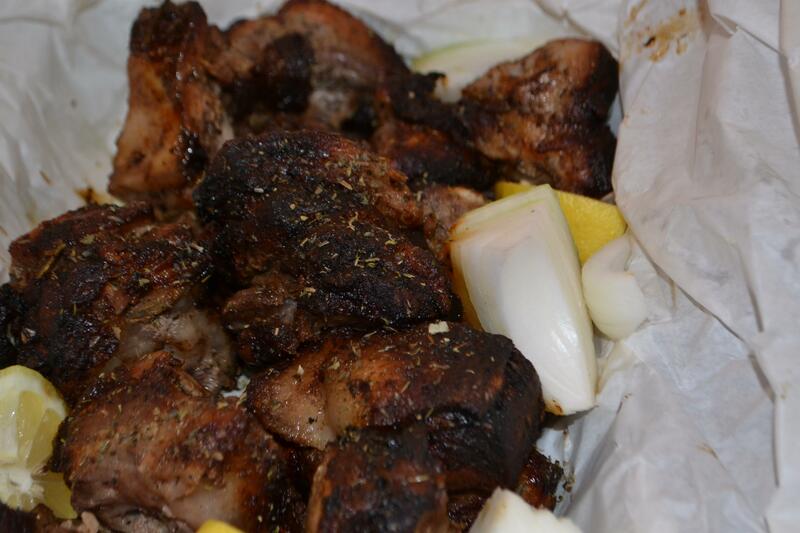 In Cyprus, the souvlaki is usually pork, but could be also be chicken or lamb. Stifado - A beef stew with onions, tomatoes, and herbs. Tzatziki - A dip made from Greek yoghurt, cucumbers, and either dill or peppermint. Yemista – all kinds of stuffed vegetables such as: peppers, tomatoes, onions, courgettes, aubergines or stuffed courgette petals. Koupepia - The famous stuffed grape leaves. They can be made with meat served warm or as vegetarian dish that may be served cold. Zivania, a potent clear distilled Cypriot drink with high alcohol content of 45% made from grapes. Commandaria - The traditional sweet dessert wine of Cyprus. Ouzo - An anise flavored (licorice) alcohol that is made in Cyprus and Greece. It is usually mixed with water (50/50) which creates a cloudy appearance. KEO - A Cypriot beer. The company that makes KEO beer, also sells KEO water, and KEO juices. Frappe - An iced coffee drink. It is either glykos (sweet), metrios (medium sweet) or sketos (no sugar). It is also ordered with milk (me gala) or without. Souzouko - a favorite at Cyprus festivals and fairs, it is made by dipping strings of nuts in heated grape juice until it solidifies. Kourabiedes - small almond cakes coated in icing sugar. Kadeifi, Baklava and Galatopureko: VeryRich,Sweet cakes made with honey. Vasilopita - Traditional New Years cakewith one gold coin in it. The person that gets the slicewith the coin is said to have good luck all year long. Fresh Fruit - fruit is often served as a dessert. 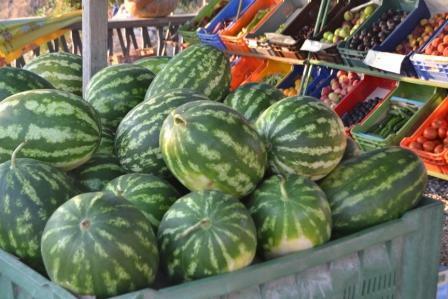 Local fruits are watermelon, oranges, strawberries, grapefruit, tangerines, melons, apples, pears, prickly pears, cherries, apricots, figs, pomegranates, bananas, plums, grapes and dates. These are generally served fresh, in season and possibly straight off of the restaurants owners own trees! Can't get any better! For more interesting and useful information about Cyprus check out our list of the Top 101 things to experience in Cyprus from food, drinks, places to see and things to do.